Leviticus chapters 1-3 have nothing to do with “sin” or “guilt” offerings. Those chapters only speak about “burnt” offerings, which are brought as worship offerings to G-d. That also happens to be the only category of sacrifices that G-d accepts from Non-Jews as a form of worship, and for them as well, it has nothing to do with sins or forgiveness. See Genesis 8:20, that Noah (a righteous Non-Jew) sacrificed kosher animals in worship to G-d, and he was a righteous man who had no sins, as testified by the Hebrew Scriptures in Genesis 6:9. Leviticus chapter 4 speaks about the so-called “sin” offering as it is translated in English, but the Hebrew term “hatas” (mistranslated as a generic “sin”) means only an *unintentional* (accidental) sin (see Lev. 4:2), for which the Jewish person is not liable to any punishment from G-d or from a Jewish court on earth, because it happened by accident! The various categories of so-called “guilt” offerings are also almost exclusively for *unintentional* (accidental) sins (Lev. 4:22,27; 5:15,17,18), for which the Jewish person is not liable to any punishment from a Jewish court on earth or from G-d. Those offerings apply if a Jew doesn’t even know if he sinned accidentally, but he became aware that maybe he sinned accidentally. There is a certain type of “guilt offering” that applies only for 3 very specific sins if done deliberately by a Jew, but they serve as a financial penalty, and not for procuring forgiveness. These are: (1) a Jew who committed open robbery, and then took a false oath of denial before the judges of a Jewish court; (2) a Jew who made personal use of an item that had been dedicated to the Temple for a holy purpose; (3) a Jewish man who raped or seduced a betrothed half-free Canaanite slave-girl. All of that is specified explicitely in the Hebrew Scriptures. Liability to punishment by G-d only applies for sins that are committed deliberately (the literal translation of the Hebrew term is “treacherously”). There are no sacrifices (neither “burnt” offerings, “sin” offerings or “guilt” offerings) prescribed to obtain G-d’s forgiveness for a sin that was committed deliberately. What is required is personal sincere prayers of confession and repentance to the One G-d alone, and restitution if another person was harmed, and then G-d forgives: see Numbers 5:6 (where there is no mention of a need for any blood sacrifice, because it only talks about a deliberate sin, for which a person is liable for punishment by G-d). You should carefully study Psalm 51, which is King David’s prayer of confession and repentance for a deliberate error, for which G-d does not specify nor want any blood sacrifices. Rather, G-d only looks for the sinner’s personal repentance (see Psalms 51:18,19). “At – One – Ment” = coming back to being united with G-d. The fact that a Jewish person sinned accidentally (which doesn’t incur any liability to punishment from G-d) means that he had let himself get distracted or forgetful of his personal bond with the One G-d. 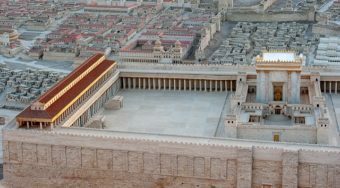 The purpose of the “hatas” sacrifice in the Temple was to serve as a gift to G-d, to re-establish that personal bond that was interrupted by the person’s distraction or forgetfulness. Again, in the absence of the Holy Temple, an interruption of the required constant mental bond between a Jew and G-d (to the extent that the Jew could accidentally sin) is re-established by prayer. The “atonement” gift to G-d is accomplished by giving donations of proper charity from one’s income. Question: How does the Holy G-d allow a sinner into Heaven, without atoning for it with blood? Answer: For a soul to be be admitted into Heaven after life on earth, the deliberate sinner must repent before he dies, because personal repentance is what brings G-d to remove the deliberate sin from the person’s soul (see Psalm 51). “What is repentance? It is when the sinner abandons his sin, removing it from his thoughts [i.e. he will from now on push out from his mind any impulse to repeat the sin], and is completely resolved not to do it again. Alternatively, if the soul is judged by G-d to be more worthy of reward than deserving of punishment (and of course G-d takes all the factors of the person’s life into account), but the person died with some unrepentant deliberate sins still attached, G-d can send the soul into Gehinom (the purgatory) for a period of time to cleanse those sins from the soul, so it can then enter into Heaven to receive its reward.